JOHN OGDEN. 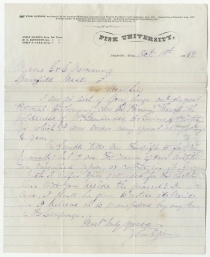 Autograph Letter Signed, to George and Charles Merriam. Nashville, Tenn., Oct. 18, 1869. 1 p., 8½ x 5¼ in. On Fisk University letterhead. John Ogden, co-founder and first President of Fisk University, was a noted abolitionist and a pioneer in African-American education. The university was founded by Ogden and the Reverends Erastus Milo Cravath, and Edward Parmelee Smith, all members of the northern American Missionary Association. Established as the Fisk Free Colored School, the institution opened its doors in 1866, barely six months after the end of the Civil War. It was one of the first colleges for freedmen to operate in the former Confederacy, and is the oldest higher education institution of any kind in Nashville, Tennessee. 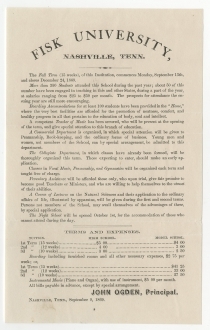 Ogden’s letter is accompanied by a printed circular describing the available courses of instruction and prices for tuition and boarding. 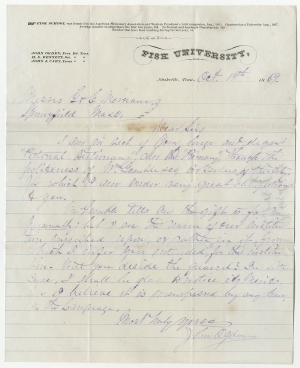 Dated in print “Nashville, Tenn., September 9, 1869.” The circular notes that “Classes in Vocal Music, Penmanship and Gymnastics will be organized each term and taught free of charge.” The famous Jubilee Singers were organized at Fisk two years later, in 1871. Old folds as expected, small spot of darkening, else Fine; circular with two faint fold-lines, still fresh and bright.